NICHOLAS STEINDORF. 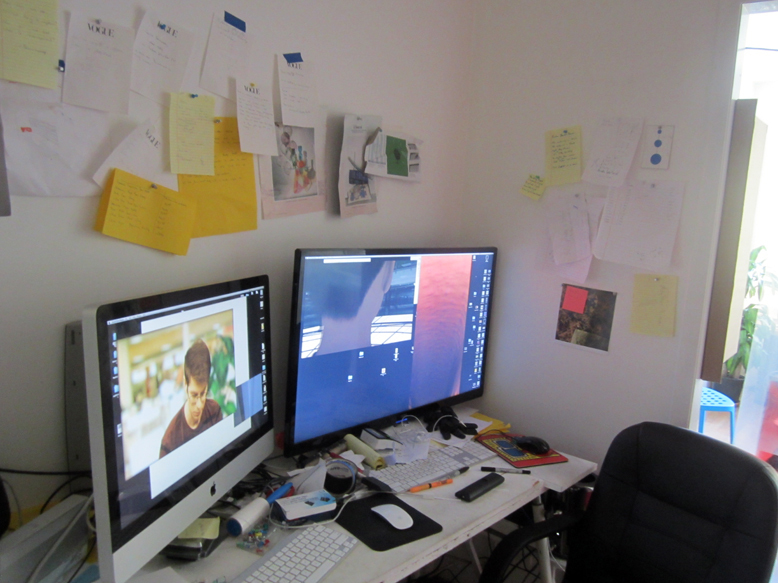 all of Nicholas’ work is computer generated, or digitally directed in some way, so no wonder – his desk with its big screens, and all the free-flowing notes, is the first thing that greets you as you open the door. the ‘core’ niche, the ‘head quarters’ – literally. 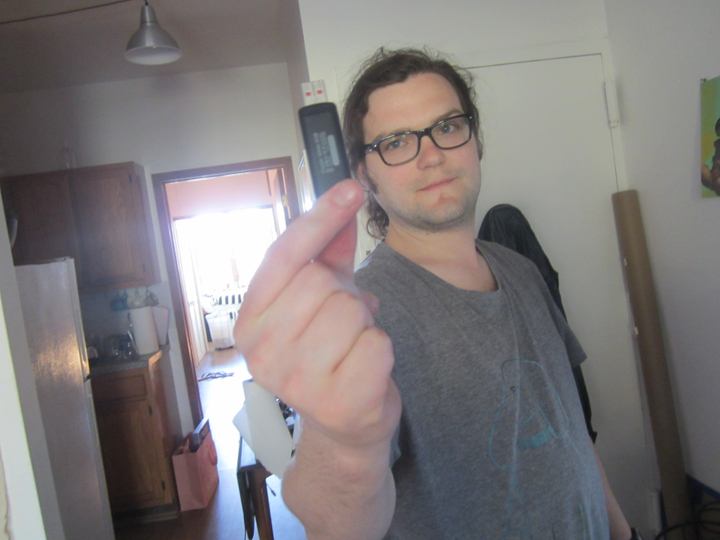 Nicholas lives and works in a floor-thru second floor walk-up in Greenpoint, just off McCarren Park. I had come to pick up the short video piece of his, with original sound track by DARREN WILL, that I had purchased at Spring Break, 2015.
titled ‘PURPLE’, it was a brief projection, that was more of a kinetic ‘sculpture’ – than a film in the conventional sense. an intense pulsating energy ‘beam’. 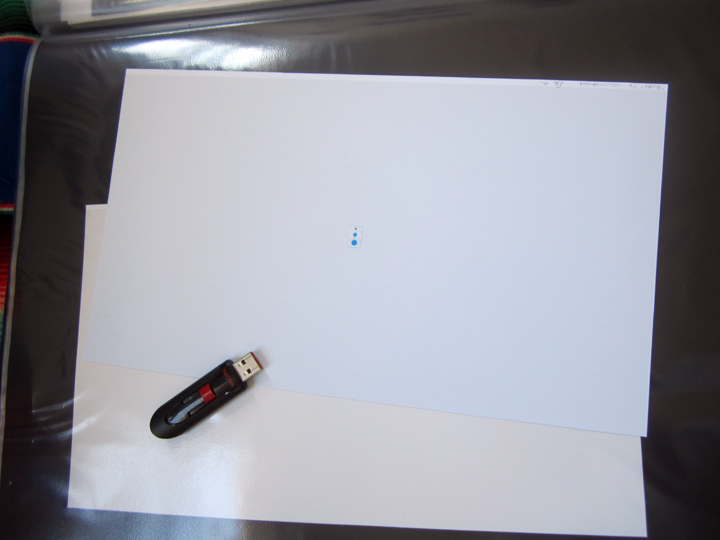 a tiny pulsating force of a nano ‘dot’. . played out against a large white screen. 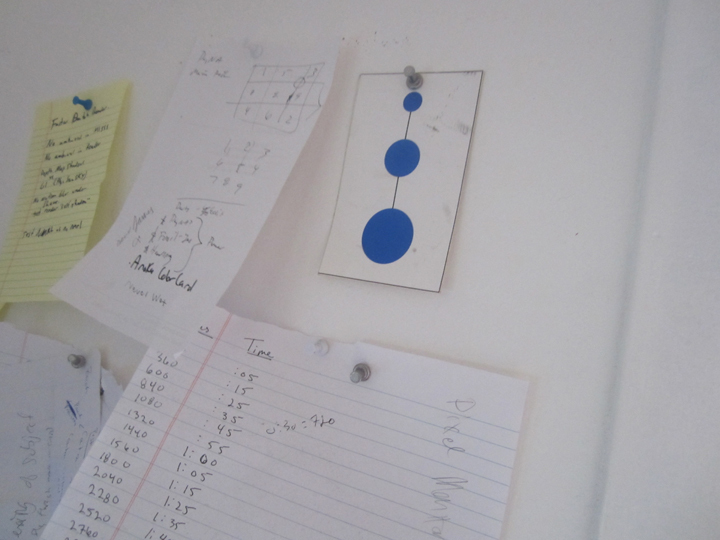 he had told me at the time I saw it, that it wasn’t ‘just’ a color dot, per se – but that it was a simple color ‘code’ card, that was switched from front to back ? 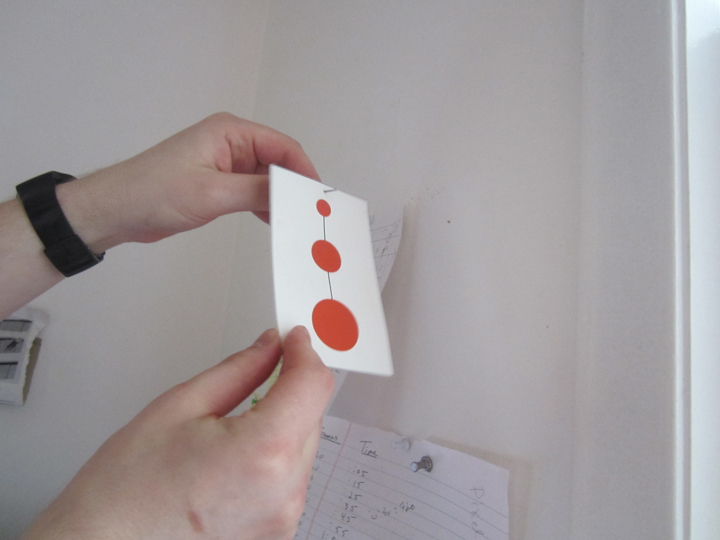 I couldn’t really visual it, but I instantly recognized the small color card – as the image source, of my kinetic video loop. so curious. almost the story of evolution, 2 cells meet and multiply. on speed. the parts becoming greater, as a whole. 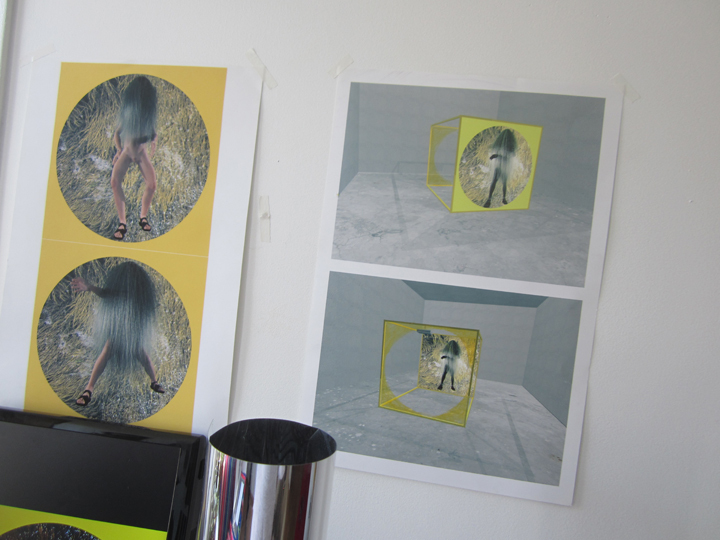 what’s the point of a studio visit, if you can’t get ‘behind’ – the scenes !! blue card to red card, on the reverse. twirl ’em fast . . red and blue: make purple. but. it felt like Houdini, making bare – a magic trick !! watch: ‘Purple’, 2015 – animation & concept by Nicholas Steindorf, sound track by musician Darren Will, you’ll see why I fell . . hard. very brilliant, very aggressive. poetically severe. playful. bullet-paced. curious, even futuristic. even planetary. totally graphic, yet very sensual, physical. holding the magic trick card – on edge. crazy enough, I first meet Nicholas a few years back – through a random throw of Craig’s list. somebody I knew was looking to rent a room, found a share they liked, and threw a typical Brooklyn house-warming dinner party. Nicholas was one of the roommates, and his small early paintings, acrylic on canvas were on the walls, and so the dialog began. I look back and think, how ironic. this digitally-sourced , absolutely random, luck of the draw meeting – with a new generation digital artist. and the dialog, just kept moving forward. two art world ‘junkies’ going . . ‘smack’. a metaphor of course, but, yes – that intense. one a newbie, Nicholas – with new skills, and a new vision, with a new scene just starting to emerge around him. the other, the old battle-scarred veteran, me . . with plenty of first-hand tales from the old days, when the ‘giants’ ruled the Lower East Side, back in the 80s. at this point, I wasn’t quite sure what a ‘digital’ artist was. but I quickly found out, via several intense video screenings of Nicholas’ work – CGI animated, mostly abstract-leaning, pattern-dominated video loops – presented by YULIA TOPCHIY, of Co-worker – at the chic downtown boite, Entwine. these videos were, compared to the small dinner party paintings, very experimental. they came off as purely abstract animation, a lot of kinetic patterning, usually with some kind of poetic narrative informing the ‘action’. 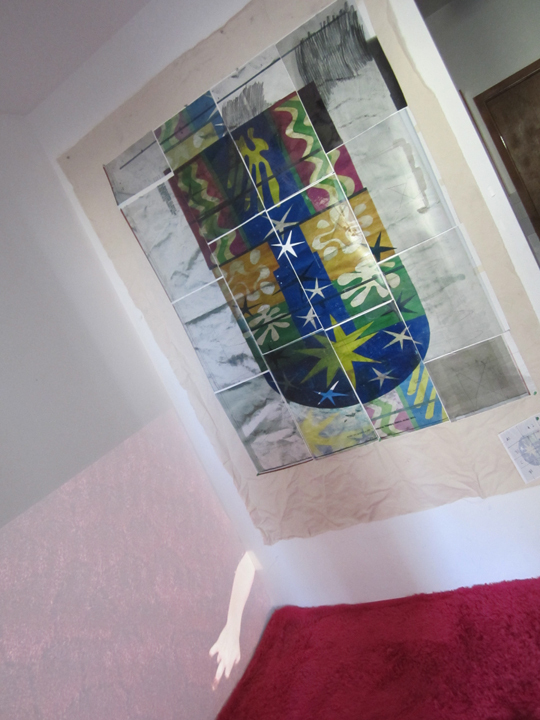 some of the patterns were easily seen as based in reality, and then digitally manipulated. but only by a big, big stretch, their ‘source’ wasn’t the point, the pure patterning was the point. fast forward, a few years later, and here I am walking into his studio. and, wow. his work had done a 360.
it was still animated and digitally manipulated, but the final image was not abstracted down to visual elements or repetitions. it had become CGI hyper-real, focused on a man-child, and furthermore, it . . took off in a sci-fi direction !! things were very hyper-real. and yet totally . . fantastical. I’m talking ‘Zach’. Nicholas’ new series, some of which were recently screened – in Paris. the boy who plays with . . fire. 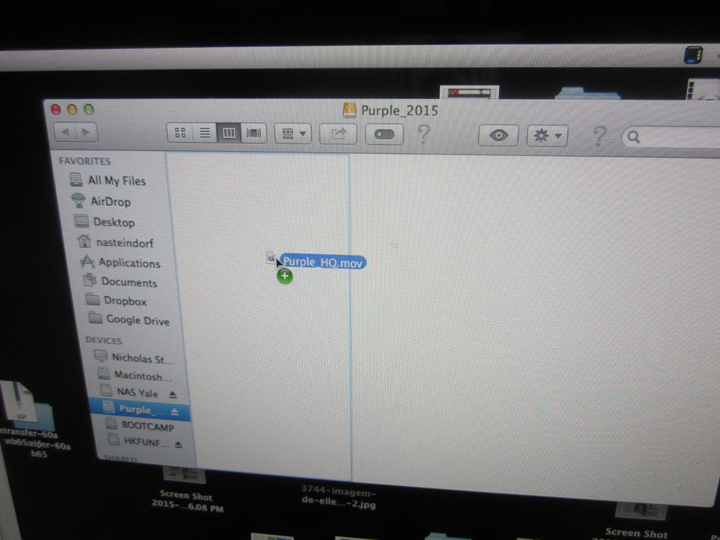 I guess you could say, ‘Purple’, 2015, was the height of that earlier kind of digital animation. very abstract, but then it flipped, a creative corner, quite literally. 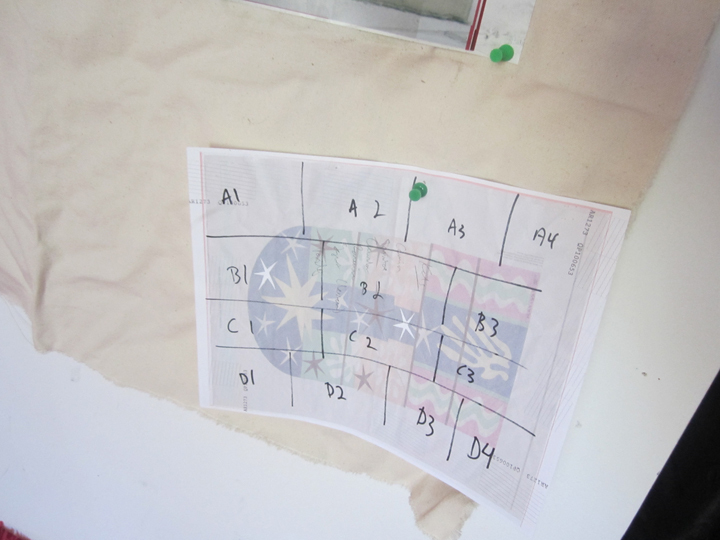 a seemingly very ‘abstract’ patterning, was in fact – a speeded-up, and very simple ‘color’ card – trick !! and now, I was struck by how everything had changed – again !! the ‘Zach’ project was very literal, hyper-real. yet fantasized. blown-up by kind of pumped-in science fiction. very post literal. very surreal. 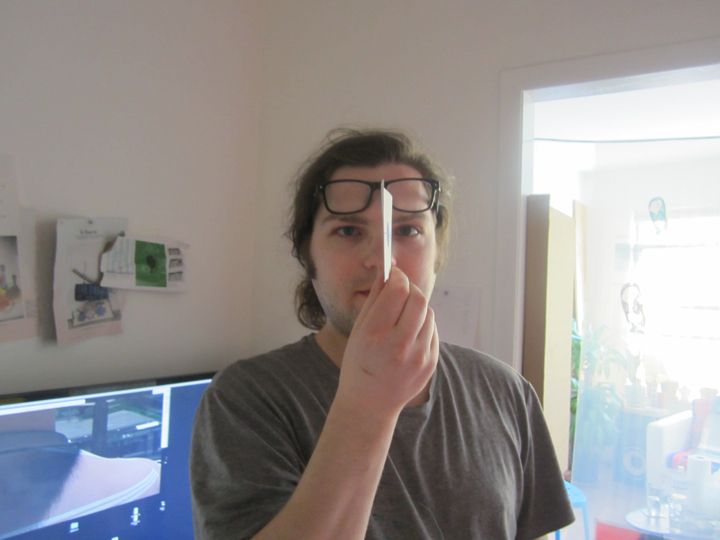 and yet – there was also this other element, in the studio today. a visual force harder to put down in words, in the midst of this very literal CGI boy-man, who looks like a proto-scientist ? a floating scrim, a transparent veil, a non-digital . . material transparency, fluttering by . . almost everywhere you looked. 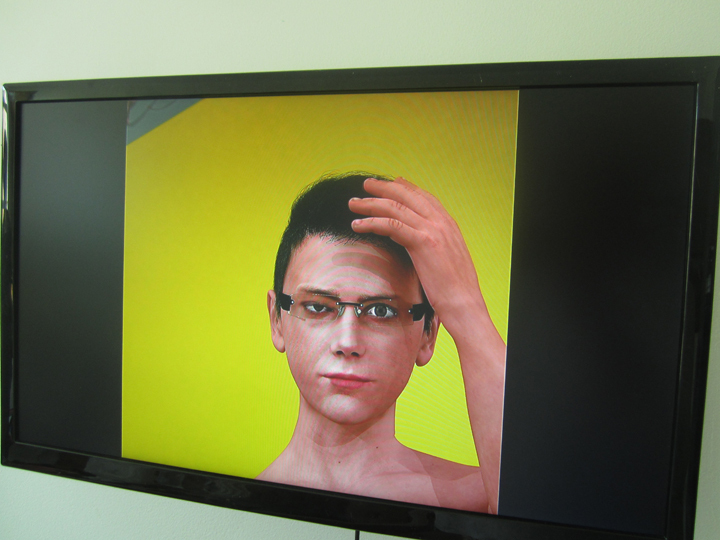 hyper-real computer wizardly action – meets the elusiveness of the physical world. 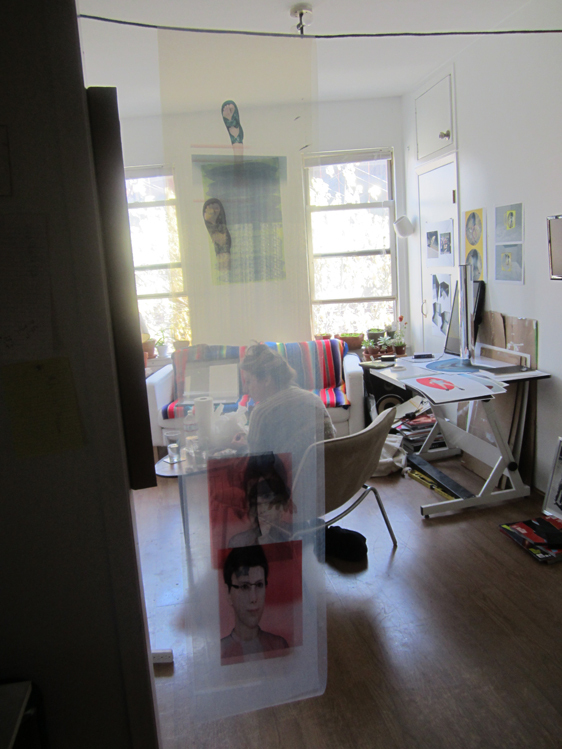 the studio space itself was animated by real light, caught on the surface of things like transparent, mylar banners, and screened windows. it was a strange polarity, it was something you experienced physically, visually, not just intellectually. like they say, a photo – is worth a thousand words. 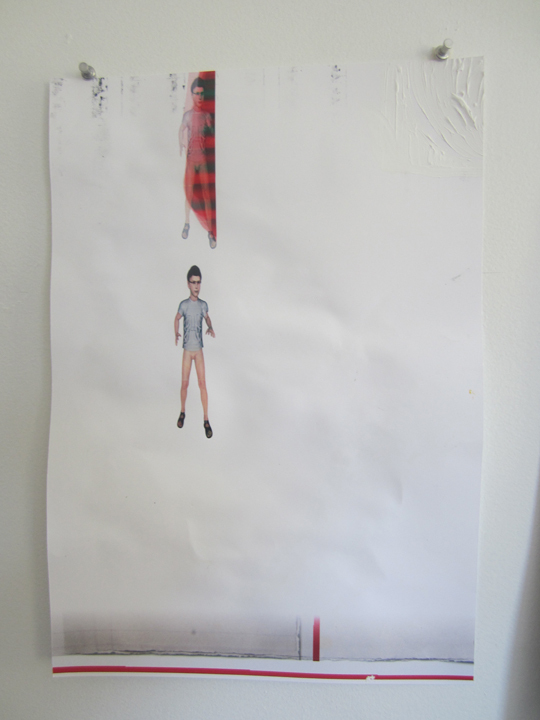 NICHOLAS STEINDORF, a ‘still’ variation of CGI manipulated, was a real boy, ‘ZACH’ – printed on a transparent mylar / clear plastic . . suspended ‘plane’. elusive, a printed hyper real image, plays across a transparent banner that plays with the room’s reality, and, actual light – in 3D. a kind of . . ‘light’ sculpture ? the view to the . . window, the real-world, real-time source of the natural light. the total effect, even if the individual image itself, was CGI-derived, is the very opposite of computer-generated, in that it is, just the crossroads, the casual moment of . . real life. the transparent material of the banner activates the drama of the light play. 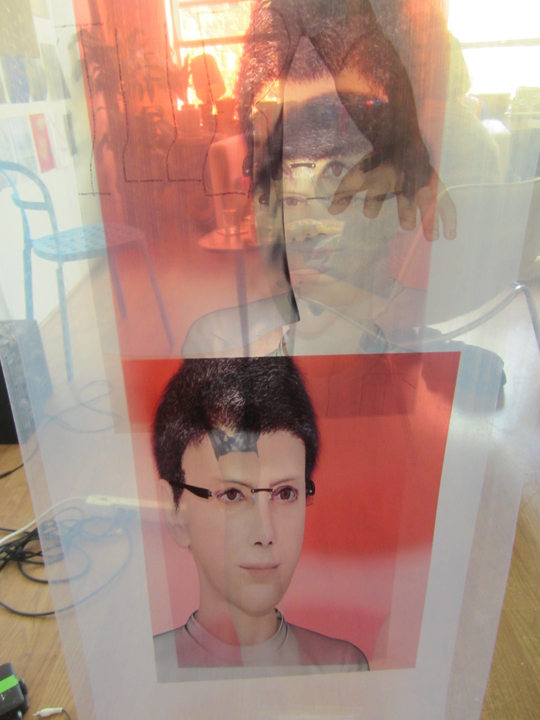 and the hyper-real, graphic printed image of ‘Zach’ shifts around to great effect, because of that. conceptually – it was many-layered. it was hard-edged graphic vs shimmery. elusive. floaty. 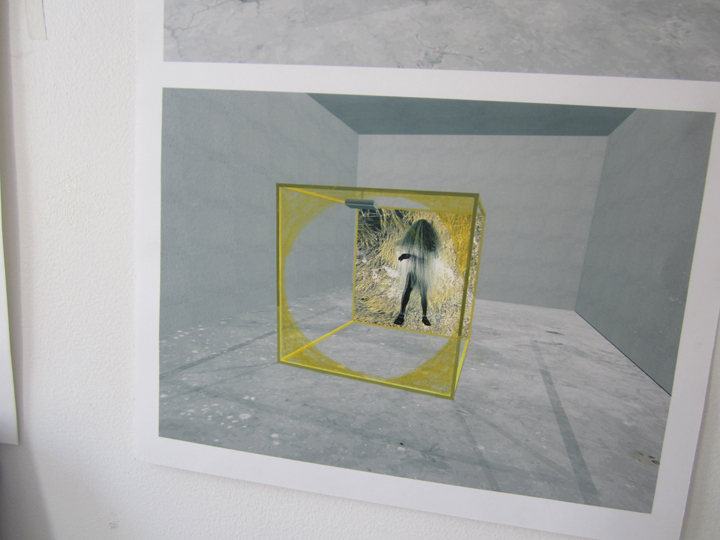 a many-faceted manipulation of reality . . that started life off, as a CGI image. ? on another wall, that same effect. a ghostly ‘scrim’ panel wavers, above a deep pink, fuchsia shag rug. a ‘texture’ collision. a surreal, but very real arm . . floats by. metaphors . . begin, and the story line . . beckons. but the real impact – is one of surfaces. like-wise, light shimmers . . from the stained glass windows of Matisse’s cut-out Chapel. what is it about ‘up-endedness’ – that appeals to us so much, in this age of a thousand up-right images a second ? what, are we questioning ? or just trying to be . . . noticed. 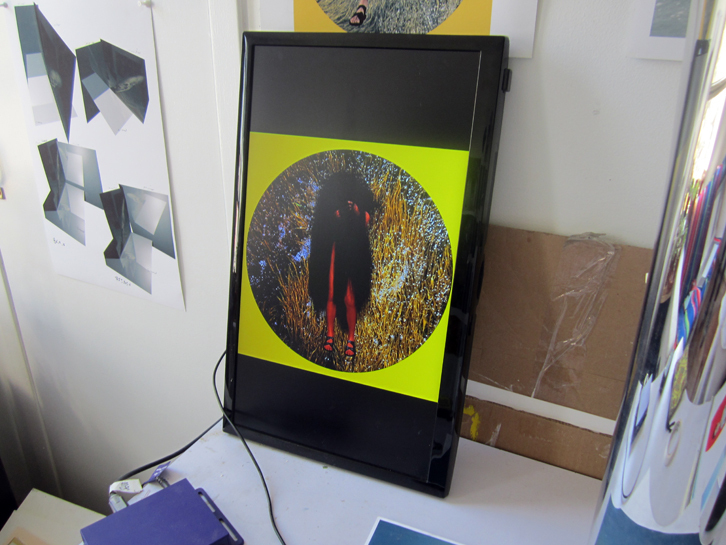 the rare treat that is a . . studio visit. 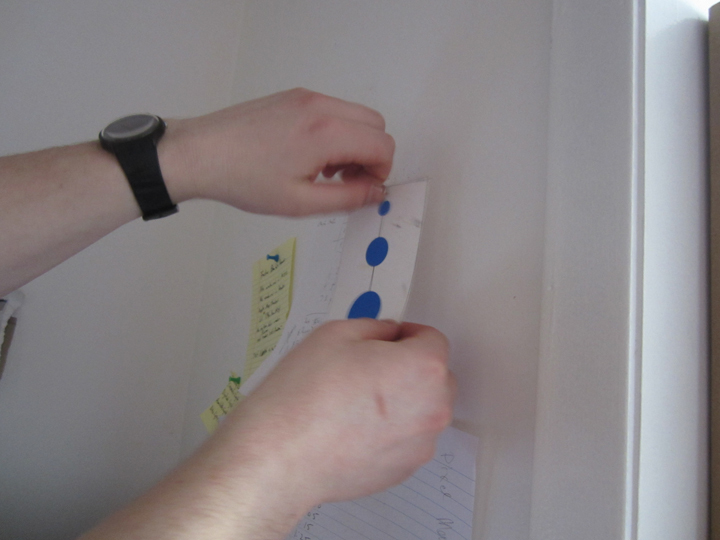 an artist’s note – stuck to a bottom corner. Nicholas’ world is quite literally – non-stop. these ‘Zach’ studies have a classical . . Da Vinci feel. the first ‘Zach’ image I ever saw, was the quasi-boy child man, playing with a lit candle or was it a match . . on fire, arranged in a fashion heavily favored by Andy Warhol, a typical straight-forward 4 patch grid – or basic . . quilt style. or is that a very rough, thoroughly really refined, take-off on a Brit Brit kind of FRANCIS BACON . . ‘light’ & cubic geometric figure thing-y thing, at play ? like the Matisse reference, Nicholas has a lot of conversations going on in his head, all at once, and this is his way of detailing some of them – for us. thought becomes a prism. a personal geometry. a study. everything is up, for . . examination. sometimes it seems he takes time to dialog with the great art that is out there, showing us . . a moment of intersection, with the greater artistic community. maybe just because he is zooming, so fast, so forward. and showing us that, hell no – he doesn’t just talk to himself. art history meets futuristic sci-fi, head-on . . is a big part of it, the human code, the human dialog. I like it. I like to see . . the ‘passwords’, the under-pinnings of some of that thought process. anyways, all thoughts aside, this a really nice, beautifully articulated piece. this one reminded me of . . childhood, the code was: Where’s Waldo ? where’s Zach. in a more comic stance . .
and yet confrontational as well. where, are – we anyways ???? it’s a real not so ‘comic’ scene out there. I just read this morning some guy is saying, soon the human race will become extinct itself, killed off by super robots. the studio apartment’s back yard windows, the source of the natural light. 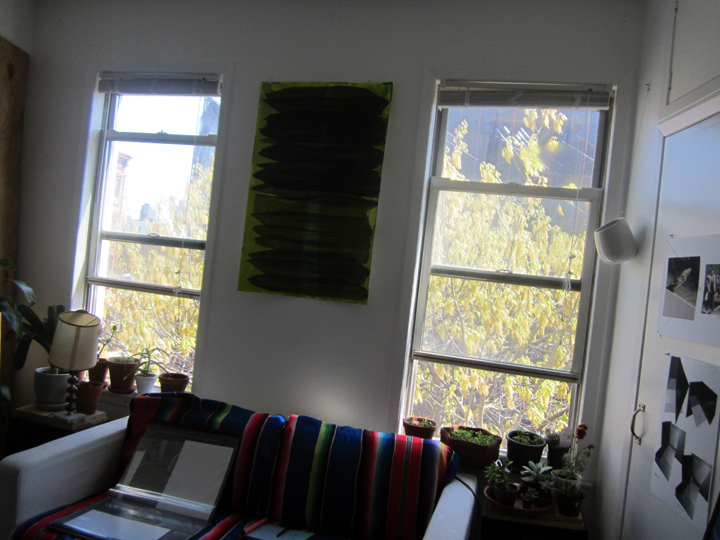 one of my favorite pieces, is on that wall between the windows, it looks to be totally abstract, great colors. but it is actually based on a whale sighting he had in Maine a few summers back. it is an over-print. it’s a great reduction of Nicholas’ workings, take what’s real . . and run with the ball. 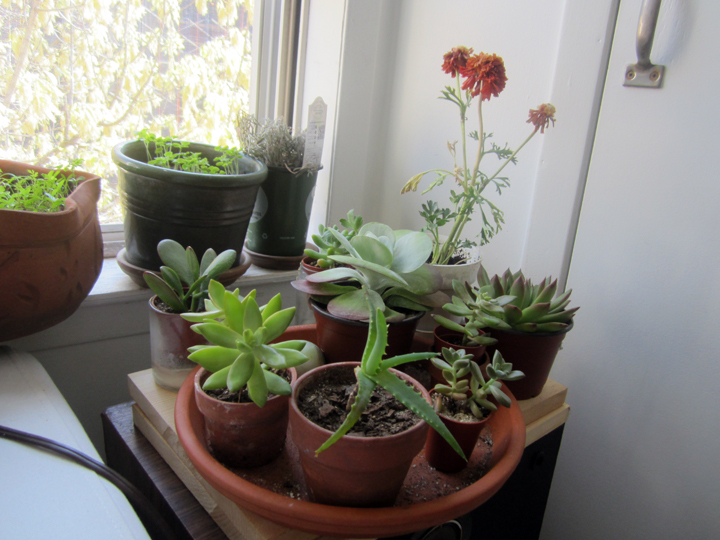 a succulent ode to water-parched . . L.A. ?? so fun to see how grounded this digital dreamer is, after all. 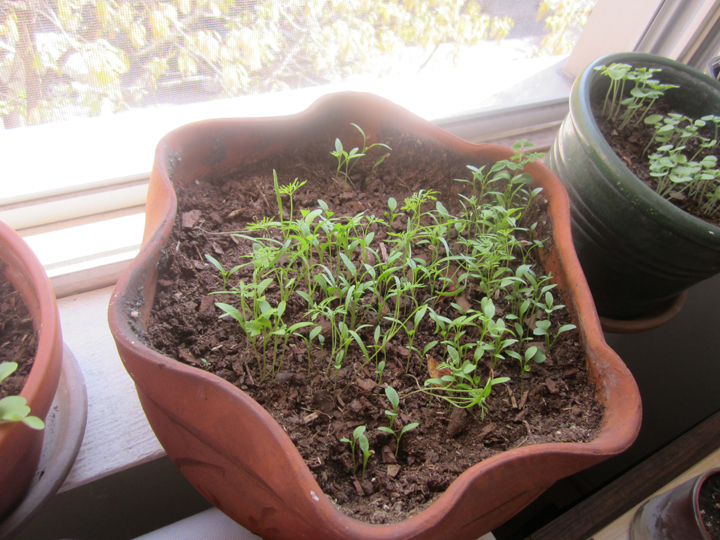 grows plants from seeds in CLAY POTS – !! 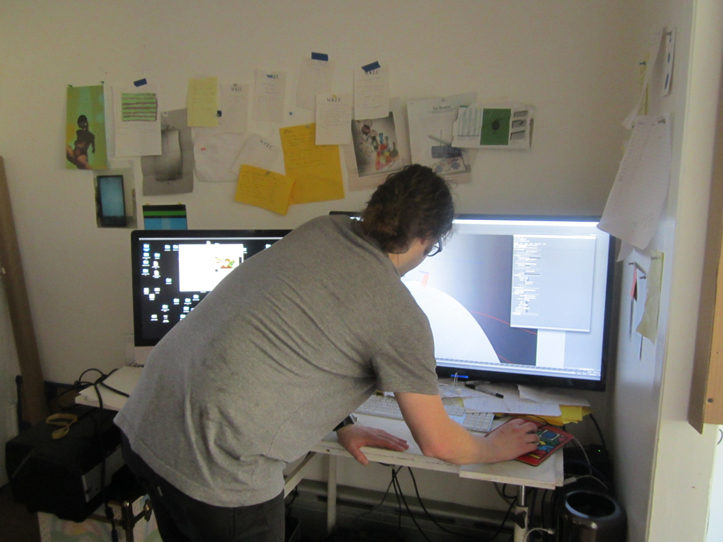 it’s Brooklyn 2015, and the hand-crafts, including a little window ‘gardening’ – is how these computer dare-devils, balance things out. plus it’s so positive, of a stance, amidst all the surreal anhilistic, nihilistic (?) ‘Zach’ imagery. code born of a world culture gone digitally – stark mad. humans: curious. humans: compete, compete. rip off. red tape. war, war, anger. and if not, then, for sure: corruption. and blood feuds. entropy. environmental degradation, tragedy, space exploration ? hi-def cameras speeding into deep space, 24/7 surveillance down on the planet. reproduce, copy, copy exactly. 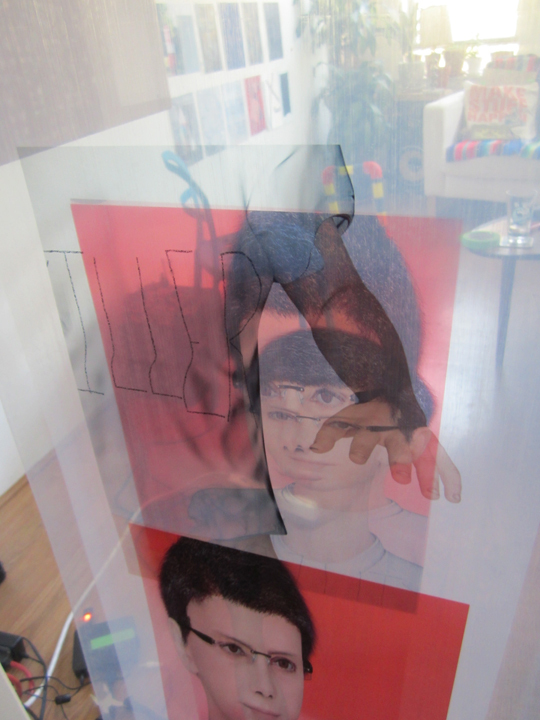 you can see that ghostly ‘scrim’ effect – happening in the window screen too. unintentionally, but still, there. mother nature vs the computer – that ultimate clash. elusive reality vs manipulated parlor trick. from the window garden gazing , we get to downloading . . my copy of ‘Purple’ !! sold for $1 per MB – at Spring Break – it was a bonafide collectors’ opportunity, if you were smart enough to grasp it. limited edition of 3. 36 MB – $36. my first strictly, CGI animated video . . purchase. and I’m sure I have several digitally manipulated art works in my collection, but this is strictly my first loop on an SD memory card. that’s a kind of milestone – when a new medium enters your collection. a computer file is like a . . ‘seed’ – !! my very own SB card of – ‘Purple’. 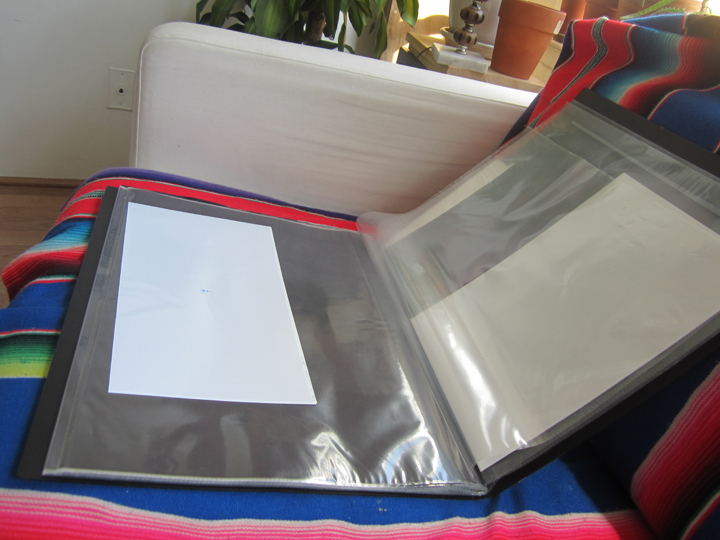 my hard copy – print. 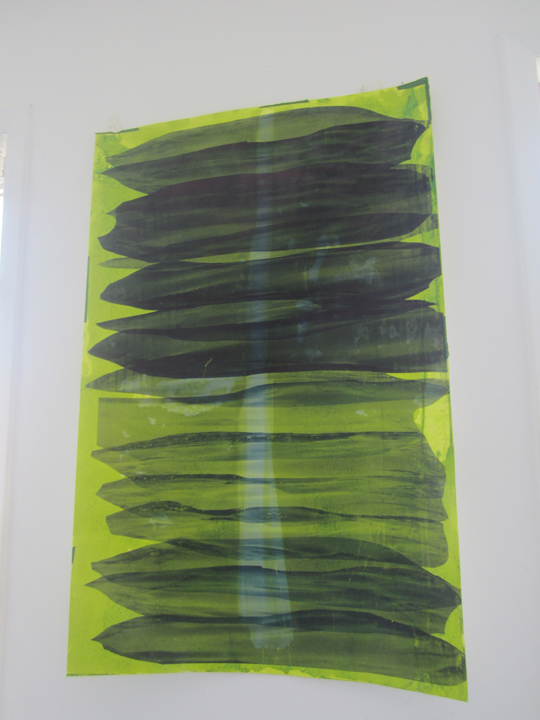 my Spring Break Art Fair 2015 – ‘transaction’. 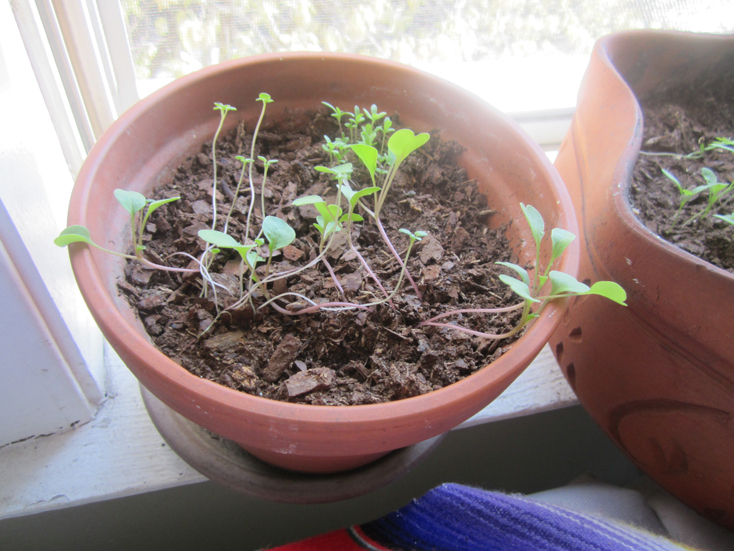 almost as organic, as a tiny plant growing on a windowsill – in Brooklyn.